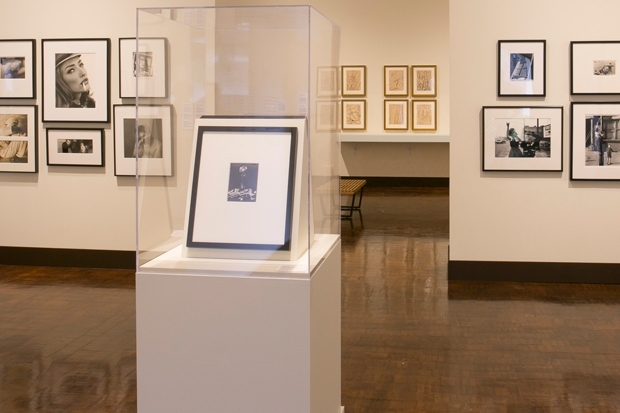 On view in Recent Acquisitions is a smallish cubical display with two photographic works by famed 20th-century artist Man Ray. The gift of these two works fills a gap in the museum’s collection and offers a visual glimpse of the artist’s life. The photographs—which are placed back to back—are separated by decades. Like yin and yang, the contrasting emotional forces at work in these two pieces are complementary, telling a story about the artist. On one side is L’Auto de Francis Picabia. Taken in 1927, its tone is as light as its subject—the mud-spattered rear end of the prized car of Man Ray’s fellow artist and friend Francis Picabia, who lovingly referred to his precious automobile as “La Grande Vitesse” (the great speed). The photograph echoes a time in the artist’s life that was filled with youthful energy and enriching relationships. Facing the opposite direction is Ruth, Roses, and Revolver. This work is both visibly and thematically darker, and serves as the display’s “yin.” Since L’Auto de Francis Picabia, Man Ray suffered through divorce, and fled Paris for the United States in the wake of WWII. Do these photographs represent the artist’s feelings at the time they were taken? Possibly. However, Ruth, Roses, and Revolver was shot to illustrate a story he wrote for the American literary and art magazine, View. It could be said that the photograph’s somber tone was meant only as a story-telling device. Still, it’s hard to ignore the juxtaposition of different emotions in these two photographs, given the times they were taken in the artist’s life. See these and other newly acquired works in Recent Acquisitions, open through February 15.